* free live music with Noel Cabangon, free cool Ninoy Aquino glasses, free hip baller bands, free fresh off-the-grill barbeque! 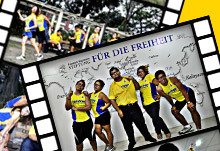 Runners in yellow and blue who believe that they should be ‘free from corruption’ will gather on Sunday, 27 November 2011 at the University of the Philippines Diliman, Quezon City for the Freedom Run. 1000 runners are expected to join the event and participate in the long line up of activities. November 27 is a significant date as it is the birthday of Senator Ninoy Aquino, father of current Philippine President Noynoy Aquino, who was a staunch opponent of dictator Ferdinand Marcos. To commemorate his special day, the famous Ninoy glasses are made part of the race kit. Runners are encouraged to wear them as they dash to the finish line, and awards will be given to the runners that carry them in style. Aside from the live music after the 3k and 6k race, participants will enjoy free barbeque and photo opportunities with celebrities and contestants of the reality weight-loss show. Freedom Run is part of It’s All About Freedom campaign that aims to translate the complex concept of freedom into everyday language. The event is spearheaded by the Friedrich Naumann Foundation for Freedom (FNF) to generate awareness and inspire people to maximize the benefits of freedom. This means providing them a venue to pursue their interests and engaging them address the restraints on freedom. FNF endeavored in this activity to appeal to all ages and sectors as it celebrates its 25th anniversary this year. The UP National College of Public Administration and Governance (NCPAG), APEX and i am ninoy are co-organizers of the Freedom Run. The event is sponsored by San Miguel Corporation, Annemie Neyts of the Alliance of Liberals and Democrats for Europe (ALDE) and Brooks Running Shoes. Registration is now on-going at www.freedomrun.ph. Fees are PHP 300 for 3k and PHP 400 for 6k.